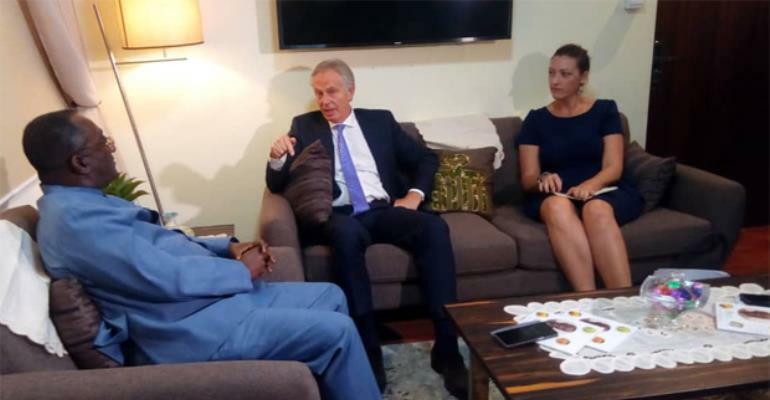 Former Prime Minister of the United Kingdom, Tony Blair, has held talks with Ghana’s Food and Agriculture Minister on investment opportunities in Ghana’s agricultural sector. Mr. Blair and Dr. Afriyie Akoto during their 30 minutes long meeting held on Wednesday in Accra, discussed how he can use his foundation to woo investors into the agric industry. During the meeting which was a follow up to two previous meetings they held in Kigali, Rwanda and London over the last six months, Mr. Blair lauded President Akufo-Addo’s flagship agricultural initiative, the Planting for Food and Jobs. He says the initiative has been well received around the world and was worth emulating. The former Prime Minister also praised Ghana’s recent progress in agricultural development and hoped that a strong collaboration could be formed between foundation and Government to help promote investments in agriculture in the country. Dr. Akoto briefed his guest about a number of initiative that the New Patriotic Party (NPP’s) administration was undertaking to develop and diversify the agriculture sector. He spoke about upcoming projects in the sector such as planting for exports and rural development, establishment of farm mechanization centers across the country. The Minister also seized the opportunity to highlight major achievements of the planting for food and jobs initiative and how other nations can learn from the model for ensuring global food security.